It doesn’t really matter in which order you do the mouth, the ears, or the hair but in my example, I made the mouth first. 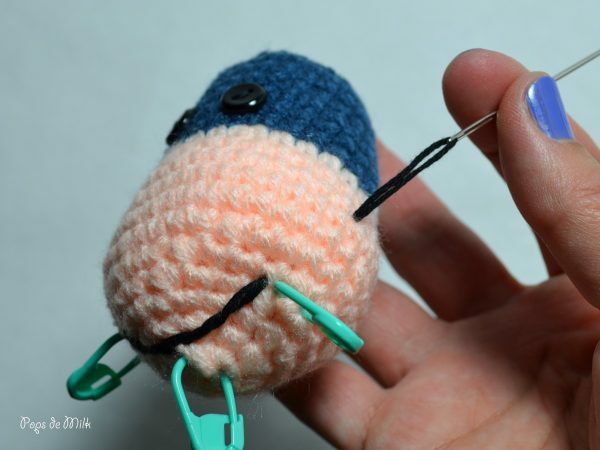 I used stitch markers to guide me in making the mouth. Embroidery was a bit daunting for me at first so if you get lost this is the video, on Nerdigurumi, that helped me out when I was first learning how to embroider details on amigurumi. 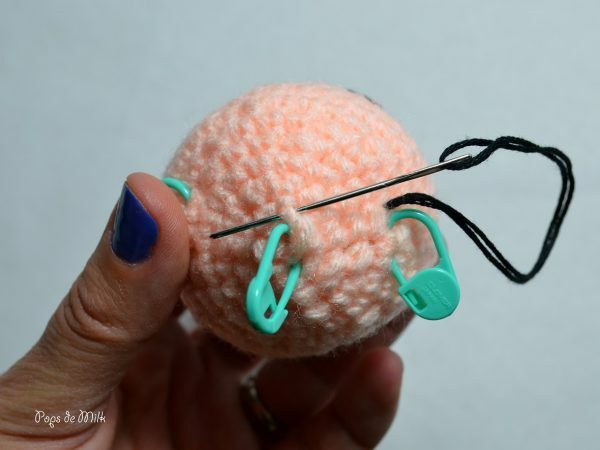 With a knotted double strand of embroidery thread, insert needle through a somewhat large opening ( large enough for the knot to fit through) and pull the needle out just above the first marker, through a tighter space where the knot won’t fit. 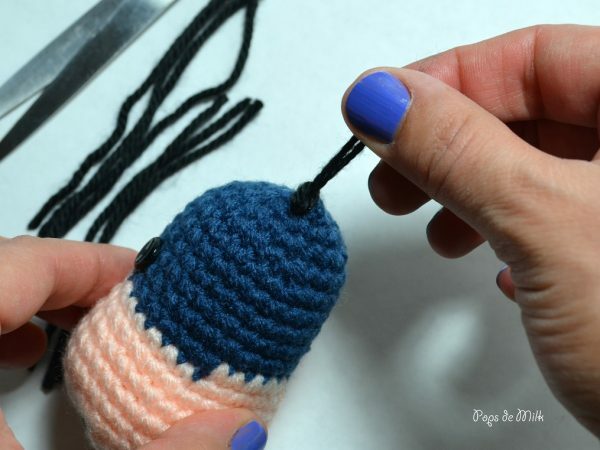 You can tug on the thread to make sure the knot is secure then insert the needle through a stitch above the next marker. 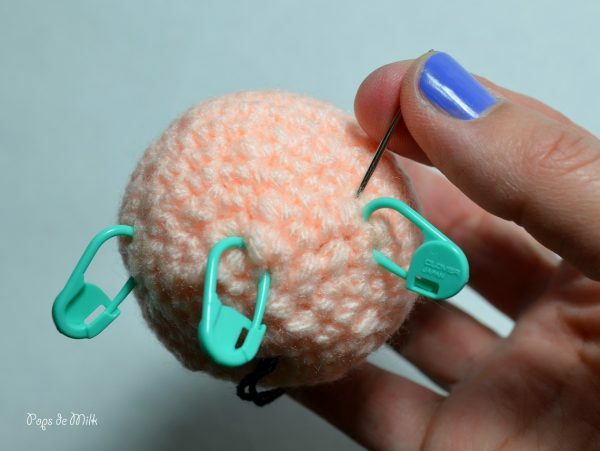 Insert needle through a stitch above the last marker. Working backwards, pull the needle under the recently added strand and repeat with the first strand. 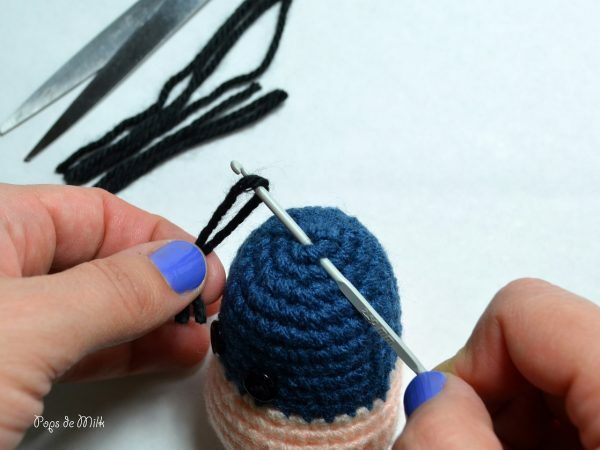 Basically, you are wrapping the thread around the first two strands to make them thicker and to shape the mouth. 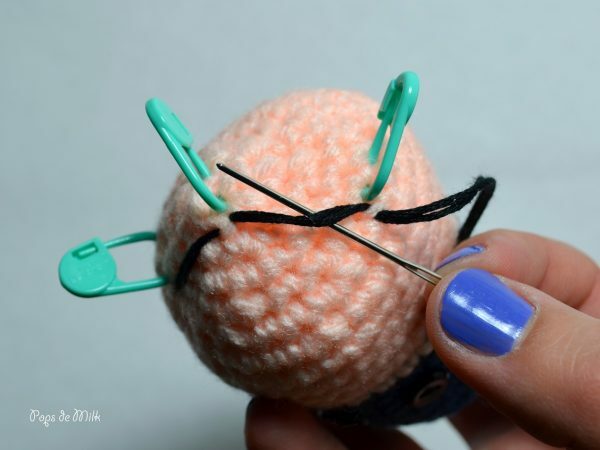 Insert the needle back through the beginning space and secure using the same method used for fastening off and weaving the ends for the head. 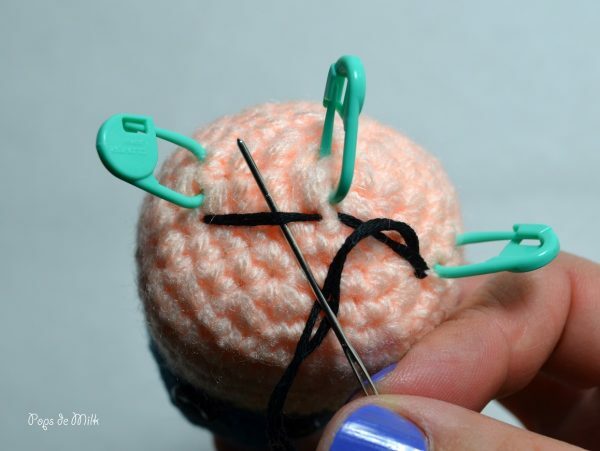 With size 3.00mm hook (or smaller if you have one) pull each strand into top of head: make a loop with the strip, insert the hook in chosen space, then pull loop through but not all the way, wrap remaining two strands around hook and pull them through the loop. Pull tight and repeat until there are enough strands to make a cute tuft of hair. Trim strands to give shape. 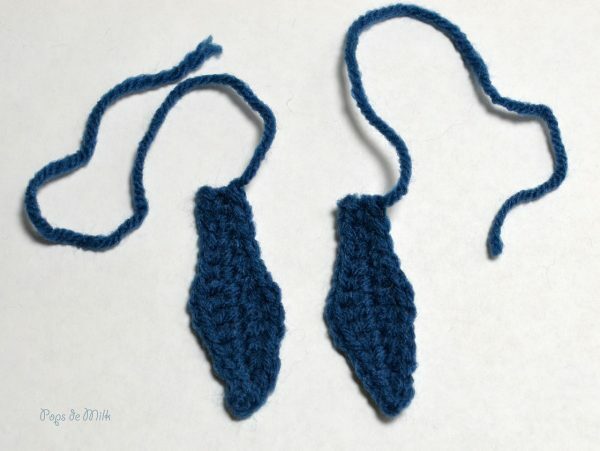 Finally, with a yarn needle sew the ears to the top sides of the head. 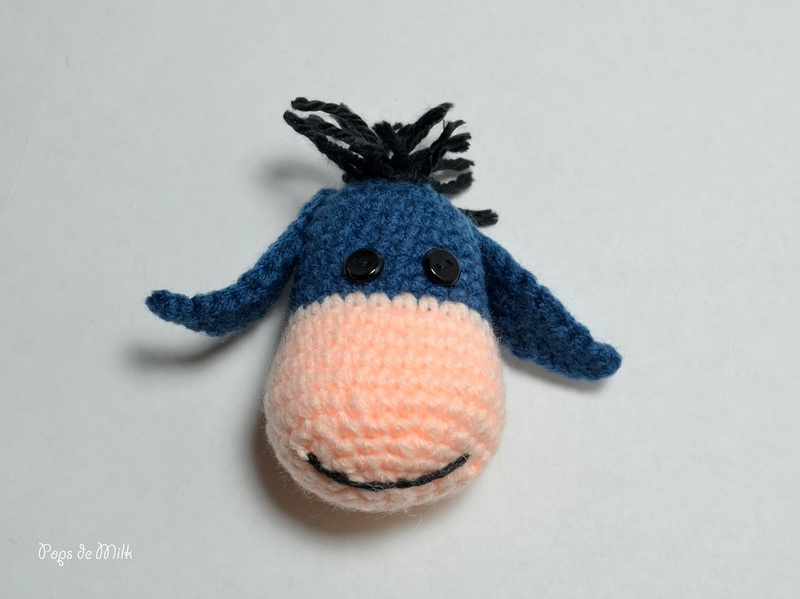 Our little Eeyore is coming along and now he just needs a body! How exactly do you make the ears? I see the photos but no instructions.